This weekend was so hot and my hair was so oily (both from adding way too much coconut oil and my own sebum.. who knew it was going to be 80° and humid this weekend -_-). I had no plans to wash until this evening, but my hair was so cranky and heavy that a wash had to go down last night. It was a quick and super effective wash though pheww! I pre-pooed with coconut/sweet almond oil on my scalp and coconut oil on the length for about 40 minutes under my new BellaNutri heating cap (love this thing. it makes pre-pooing and dcing so much less annoying :). I then shampooed once with Nexxus Therappe to make sure to get most of the oil and silicone out of my hair. I followed up that first shampoo with my sulfate-free Shea Moisture Moisture Retention Shampoo (♥). I mostly just do this to calm my scalp down after using a sulfate shampoo. The next step was my protein treatment. I used Nexxus Keraphix and left it in without heat for about 10 minutes (accidentally :p), and rinsed that out in lukewarm water. I followed up with Nexxus Humectress to check my moisture/protein balance and left that in without heat for another 10-15 minutes and then rinsed out in cool water while finger detangling. Then I air-dryed my hair and continued to finger detangle, I skipped using my Rusk Smoother leave-in because my hair felt perfectly balanced and the protein in it can sometimes do too much, so all I did was apply some argan oil to my ends and then let the back hang down while it dried. I opted to pin the front up loosely so that I could just deal with the back. I am 100% pleased with how my hair turned out. The wash balanced it perfectly, my hair felt moist, strong and it came out super smooth for 8+ weeks post! I was planning on relaxing this weekend, but I'm not sure I should. I have some tenderness in my nape so I'm going to wait for that to subside before I reach for the perm. 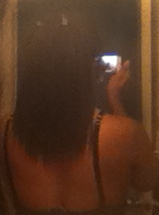 I'm also loving my new growth and its little coils, the wash/DCing also left my roots very soft and manageable. I didn't do much with it after air-drying, I left the front pulled up when I went to work. I think I'll do a twistout for tomorrow though. Sorry for the bad pic, getting a camera this weekend!